The Ad Council is joining the U.S. Department of Agriculture’s Food Safety and Inspection Service, in partnership with the U.S. Food and Drug Administration (FDA) and the Centers for Disease Control and Prevention (CDC), to debut their first joint national multimedia public service campaign to help families prevent food poisoning in the home. Oh, well okay then. I’ve always been a fan of not killing my guests. It couldn’t hurt to devote a whole post to talking about how to do that. Oh cool, a catchy slogan and a snazzy logo to go with it. So I guess you want to know what it means, huh? I’d show you a picture of me washing my hands before I started cooking, but that would be unbelievably boring. So just take my word for it on that one. 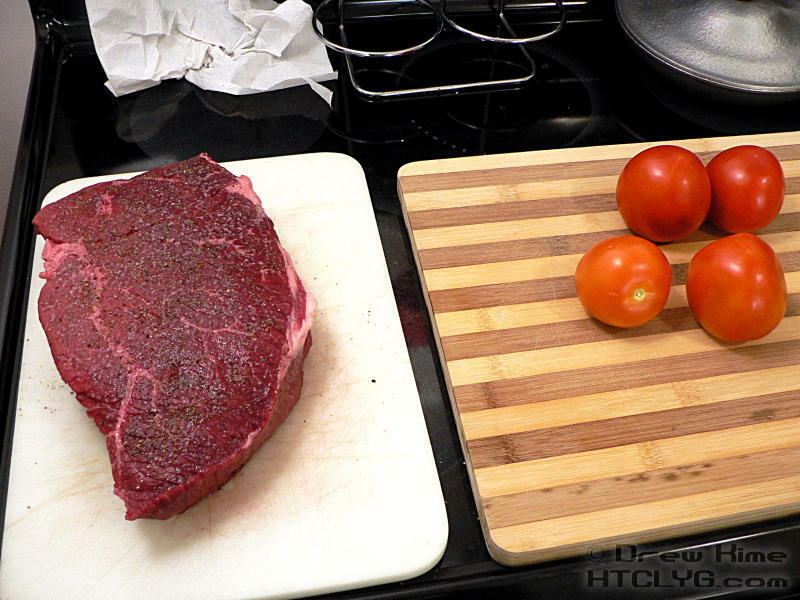 You can see here that I use separate cutting boards for the meat and the veggies. The other thing I do is use a plastic board for raw meat. I find them easier to clean than wooden boards. Keep some paper towels handy. 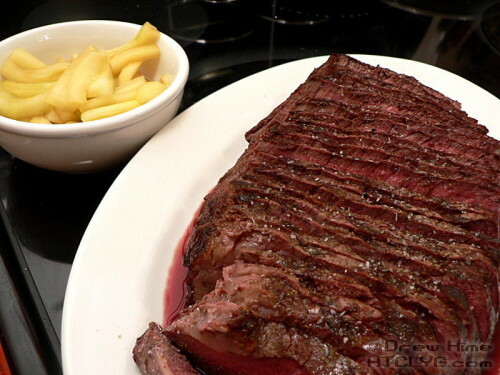 The juice released after you salt the meat — did I forget to mention you should salt the meat at least 15 minutes before cooking it? pepper, too — can start to leak off the edges. I’ve been recommending cooking with a thermometer for years. 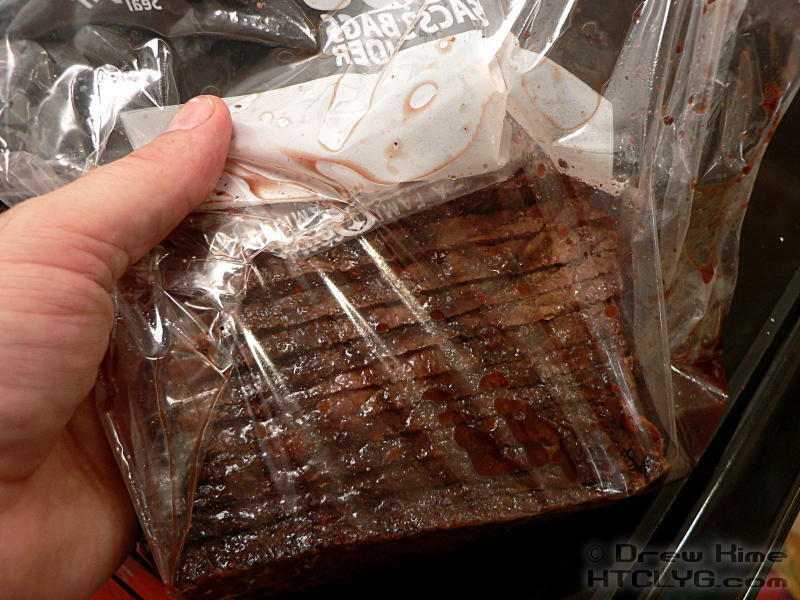 Not so much for food safety reasons, but because that’s the only way to tell if a thick cut of meat is done. 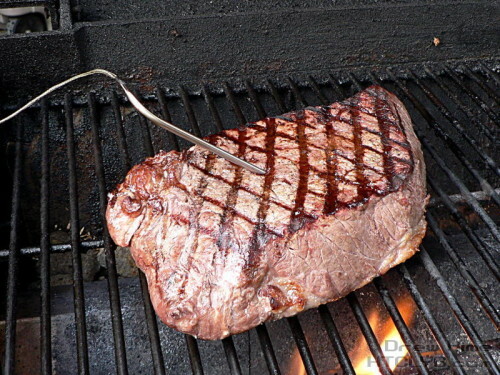 The USDA recommends cooking whole cuts of beef — in other words, not ground beef — to an internal temperature of 145° F, since that’s the temperature at which the most common food-borne bacteria are killed. For ground beef the recommended temperature is 160°, because the grinding process can move surface bacteria down inside the meat, where it will take longer to reach a safe temperature. As important as temperature is, cleanliness — or lack of it — is responsible for the majority of food illnesses. That’s what you solve by using a separate cutting board, and never cutting veggies with the same knife you just cut the meat with unless you clean it first. And as annoying as it is, wash your hands every time you handle raw meat. I set the alarm on my thermometer to go off at 125°. 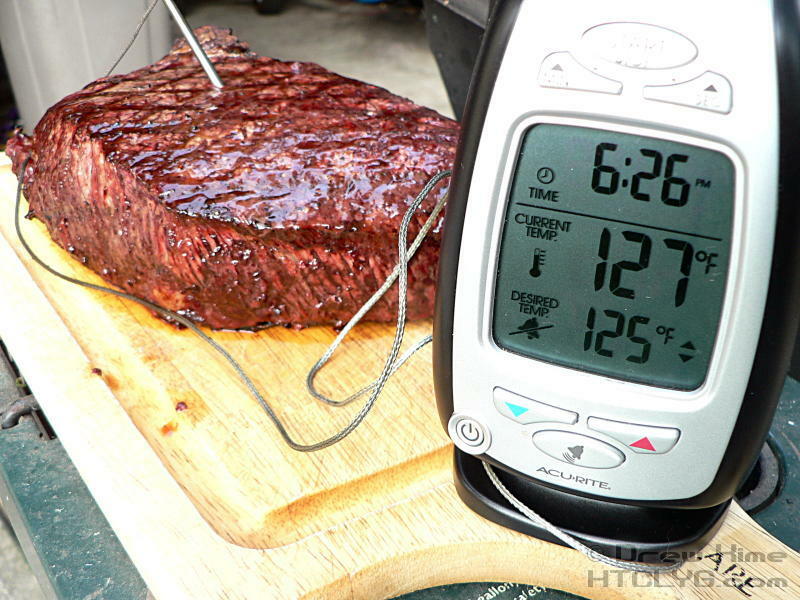 The second reason I set my thermometer below my target temperature is that the internal temperature of the meat will continue to rise even after you take it off the grill, as you can see here on the readout. Click the picture for a larger view if you can’t read it. 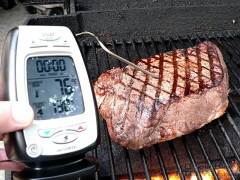 It’s showing 130° now, even though I took it off the grill at 125°. 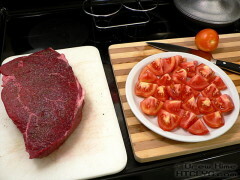 Cover your large cuts with foil, like I did above, and let the meat rest for several minutes. How long is “several minutes”? My rule of thumb is: until the temperature peaks and starts going back down. The thicker it is, the longer it takes. If you cut into it before the temperature equalizes, you’ll lose a lot of juices. And of course put any leftovers away immediately. I like a zip-top bag with all the air squeezed out. The great thing about cleaning as you go is that when you’re done eating, you’re done. I hate hate HATE finishing dinner and having to deal with a pile of dirty dishes. I’ve noticed most of the people who feel as strongly as I do about cleaning as you go also worked in restaurants at some point. Trust me, it doesn’t take any longer to cook safely, and as a bonus you won’t kill your guests. Remember, that’s half the battle. Make This Recipe Safer on Facebook! The campaign sponsors also have some handy-dandy refrigerator magnets to remind you and your family about food safety while cooking. Click here to receive your FREE magnet! Then share photos of your magnet, your personalized safety tips, and/or the dishes you’ve cooked safely on the Kitchen PLAY Facebook page. (Be sure to tag FoodSafety.gov and Ad Council!). Let’s work together to Make Our Recipes Safer! About 15 minutes before you fire up the grill, season the beef well with salt and pepper. Make sure it's on a plate or a cutting board with a drip groove, as the salt will start to draw moisture out of the beef and it can get drippy. When the grill is very hot, place the beef on it for about one minute, then rotate it a bit less than a quarter turn. Cook for another minute then flip it over. You should have nice grill marks on it now. Turn the heat down low under the beef. Leave the heat up at medium on the other end of the grill if you can. 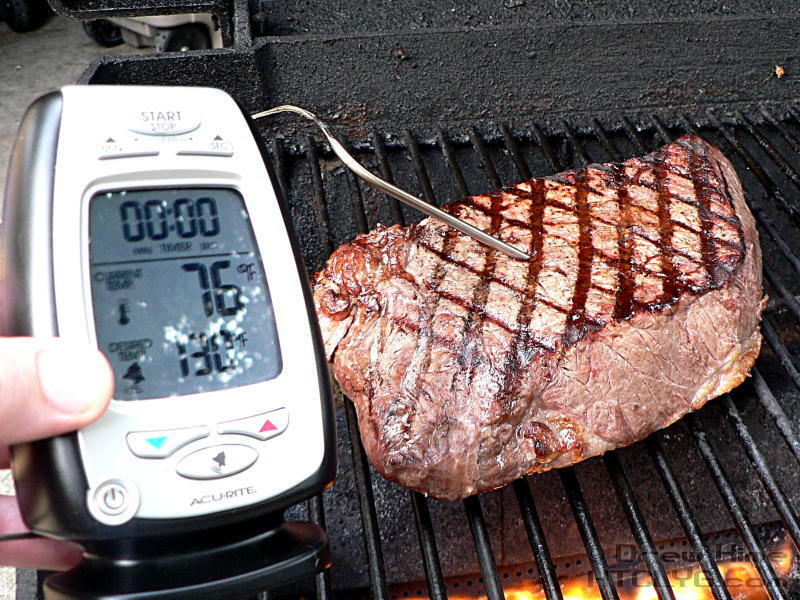 Insert the probe from your thermometer into the center of the thickest part of the meat. Set it for 125° F so you'll get a heads-up when it's almost ready. 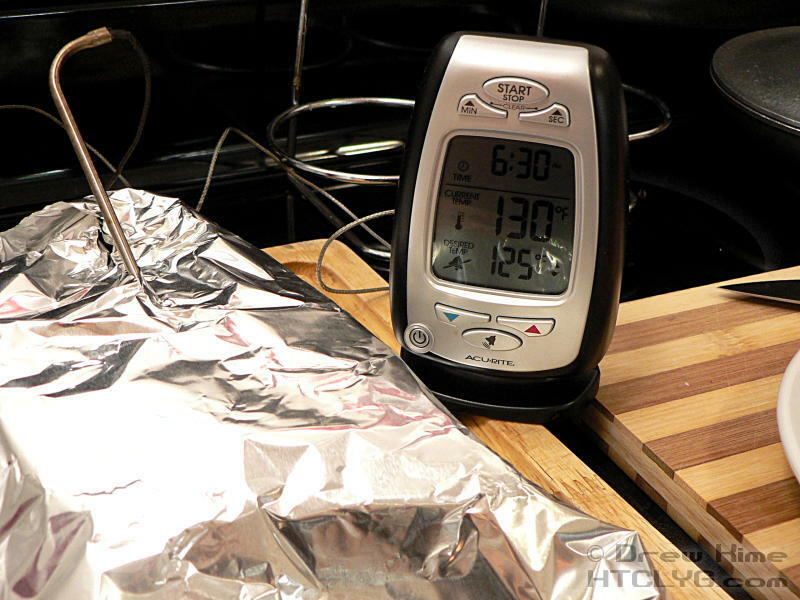 Pull it from the grill at about 130° and cover tightly with foil. The temperature will continue to rise for several minutes after you take it off the grill. When the temperature peaks and starts coming back down it's ready to carve.